Ok, I know what you’re thinking. Pasta Salad usually isn’t a very exciting dish, but this Pesto Pasta Salad is a winner. It is seriously SO GOOD. I make Vegan Pesto at least twice a week and this is by far my favorite thing to meal to make with it. Cooking the Vegan Pesto with the tofu makes the tofu taste sooooo cheesy and delicious. Add the mushrooms and the peas and I start doing a happy dance all over my kitchen. The peas add a hint of sweetness that takes the deliciousness over the top. 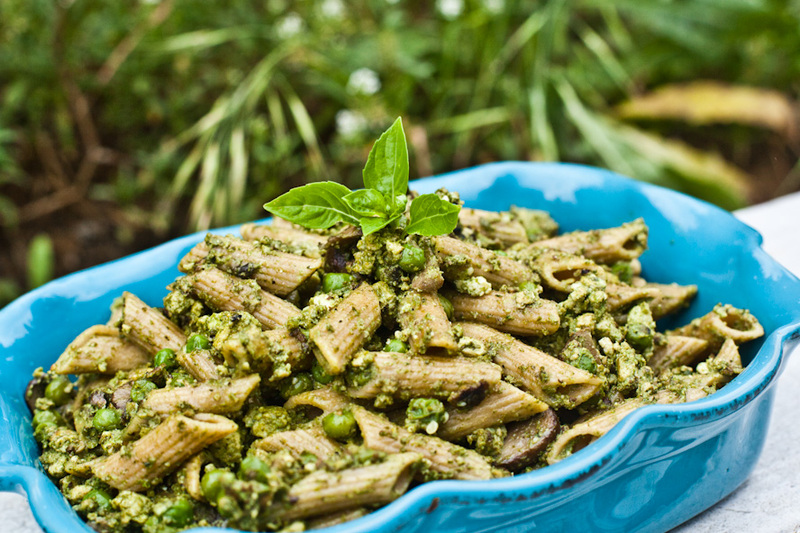 Don’t take my word for it, make this Pesto Pasta Salad for yourself! The most DELICIOUS pesto pasta ever! Cheezy tofu paired with mushrooms and peas gives this dish and incredible flavor. Perfect for picnics, potlucks, and dinner parties! Prepare the pasta according to package instructions. Press the excess water out of the tofu, blot with a paper towel, and dice the tofu into small cubes. In a large skillet, heat the oil over medium heat. Add the tofu and sprinkle it with ¼ teaspoon sea salt. Cook for 5-7 minutes until golden brown on all sides, stirring often. Add 3 tablespoons of Vegan Pesto and mix until the tofu is coated. Stir in the mushrooms and peas and cook for another 5 minutes until the mushrooms are soft. Stir in the pasta and the rest of the Vegan Pesto. Mix well until the pasta is heated. This Pesto Pasta Salad is my go-to party dish. Every potluck, every dinner party, it is always a hit. This meal is so easy, so tasty, and doesn’t it look incredible? Did you make this recipe? Leave a comment below and tell us all about it and post a photo of your Vegan Pesto Pasta Salad on Instagram with the tag #carrotsandflowers so we can admire your creation. If you love Pesto Pasta Salad, you should check out some of our other savory vegan dinner options like our Vegan Mole Enchiladas or our Tempeh Lettuce Cups! The most DELICIOUS pesto pasta! Cheezy tofu with mushrooms and peas give this dish an amazing flavor. Perfect for picnics, potlucks, and dinner parties.